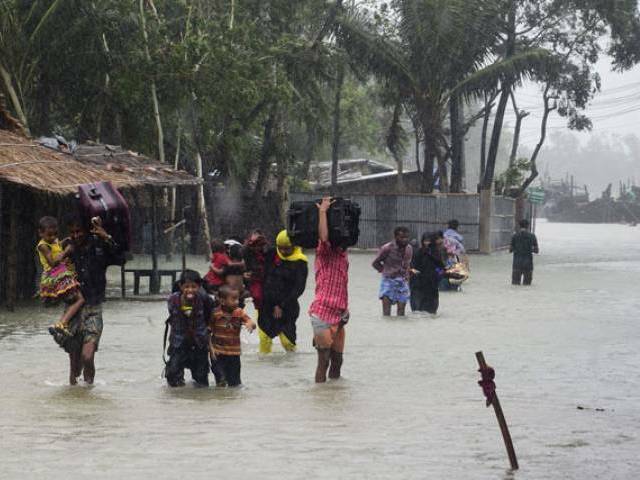 The Big Wobble: 197 millimetres of rainfall in 24 hours has marooned 500,000 people in Bangladesh as thousands of homes have been submerged. 197 millimetres of rainfall in 24 hours has marooned 500,000 people in Bangladesh as thousands of homes have been submerged. Heavy downpour of the last four days has caused flash flood in parts of Cox's Bazar, especially in Chakaria and Sadar upazilas, marooning around 500,000 people as thousands of homes have been submerged. Most of the inter-district roads have already gone under water that came after the overflow of the upstreams of the Bakkhali and Matamuhuri rivers. It is also reported that most of the rural roads, culverts and embankments got damaged in the flood. People living in the low-lying areas are left the worst victims due to the flood situation. Local public representatives fear that the crisis would deepen further if the incessant rainfall continues for a few more days. There are also reports of Pekua, Ramu, Ukhia and Teknaf upazilas being flooded. Shrimp enclosures owners said they have incurred huge losses as their enclosures washed away in the flood. Traffic through the Cox's Bazar road came to a halt due to the situation. But, the recently opened marine drive is being used as an alternative route from the tourist city to Ukhia and Teknaf upazilas. The local Met office recorded 197 millimetres of rainfall in 24 hours until 3pm on Wednesday, forecasting that the heavy shower may continue. Chakaria Upzaila Parishad Chairman Md Zafar Alam said Matamuhuri River lost its navigability due to indiscriminate pollution, leading to the situation. "As the river is not dredged for quite some time now, it overflowed after the ongoing heavy shower, causing flooding. Hundreds of houses have been inundated with road communication getting damaged heavily, leaving 300,000 people of the upazila marooned," he said. Blaming Water Development Board officials and contractors for the flood, Chakaria Municipality Mayor Alamgir Chowdhury said: "Due to their negligence in putting concrete blocks and sandbags at the embankments, the flood occurred." In the Sadar upazila, at least 2 lakh people were marooned. Cox's Bazar Water Development Board Executive Engineer Md Sabibur Rahman said they were yet to ascertain how much damage has been occurred in the embankments since the flood situation was worsening. With the water-level of the Matamuhuri kept rising, most of the residents of Chakaria and Pekua upazilas are in great danger of being heavily affected," he feared. When contacted, Cox's Bazar Development Authority Chairman Lt Col MD Forkan Ahmad said the possibility of landslide is also soaring. Meanwhile, Cox's Bazar Deputy Commissioner Mohammad Ali Hossain said they are all prepared to face the natural disaster. "We have already ordered all the Union Parishad chairmen to gear up their activities in this regard," he said. Interestingly, there was no update about measures regarding relief for and rehabilitation of the affected people.